This is officially the last page of the My Forward Steps Membership site, HOWEVER by no means, is this the final page of newly added content! 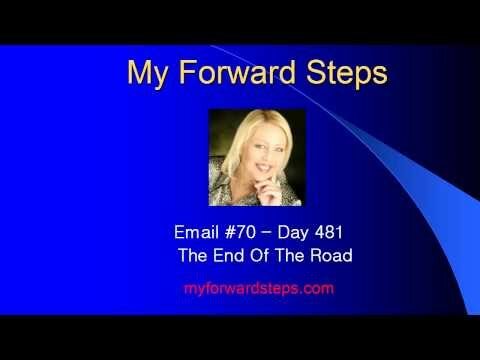 EACH WEEK, you will still be receiving an email to remind you to revisit My Forward Steps, it’s just that it will likely not contain a brand new page of content. YET, whenever I do have new content, it will be sent to you on a new content page here. After a few weeks, I will begin taking you through each of the weekly emails again from the start. However, each time you receive one, there will be added content to the Member pages and the email format may look a little different too. Any new content will be included and introduced within those emails. There will still be a new laughter fix and new wisdom video. There will always be the link to the Time For My Life Book, and there will still be a link to one of my sites that you can share with friends, every week. Each new week, there will also be a link to the home page for My Forward Steps and the Menu page for the My Forward Steps Member site so that you can easily hop in and explore what’s new or changed. And… SOMETIMES there will be a brand new content page for you. The new content pages just won’t be weekly, as they have been for the past 18-months of your Membership. Part attention will also be on going back over every page of the My Forward Steps Membership, for the purpose of adding new material, revising, updating the current content and making it a little more easy to read too, by up-sizing the font. You might already have noticed that at some pages. As well, I have many other online projects and creations that are keeping me very involved and active for the present. As a special piece of added content today, Angela Smith from True Potential has allowed me to share with you her newest book. I haven’t shared anything for children at the Member site and thought it might be a nice little addition for the parents here. Log In and you can open her new book. It’s for you to keep, however not to share please. Angela has given this as a special gift to all of you because she too is a Member at My Forward Steps.